Disneyland for adults…10 days of craft beer related events all over the city! The 3rd annual Bham Beer Week runs September 12th-21st. Kick off your Beer Week by cracking a can of Kristalweizen! This year, Boundary brewed and canned the 2nd annual Bellingham Collaboration Beer, Whatcom Wheat Kristalweizen, in participation with our eight Whatcom County breweries: Aslan, Chuckanut, Gruff, Kulshan, Menace, Northfork, Stones Throw and Wander. 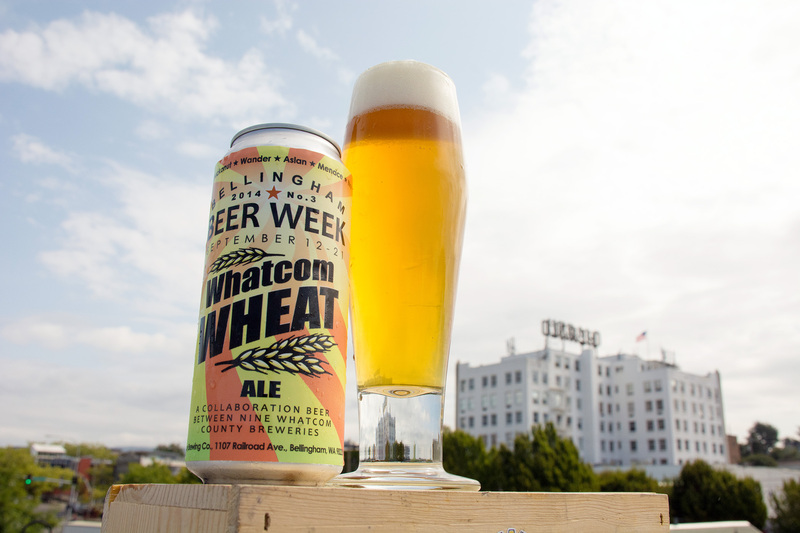 Whatcom Wheat can be found in 16oz cans throughout the Whatcom, Skagit, Snohomish and King County areas. 9/12 Brewshed Happy Hour Beer Week kicks off on Friday, September 12th with a Brewshed Happy Hour in the Beer Garden. Come enjoy Boundary, Wander and Aslan brews at our Friday Fish Fry. For every pint sold, a $1 will go to WA Wild: a non profit organization who works to protect Washington’s wild river systems and the lands they flow through, many of which supply drinking water to Washington communities and provide the water to create delicious local beers. 9/13 Compete for a Cause Cribbage Tournament Cribbage is one of those games that young and old, stranger and friend can play together in good spirited fun. It’s an all-inclusive way to put a positive spin on conflict-through friendly competition. We hope you will join in the fun and continue to support the WDRC at the 8th Annual Compete for a Cause Tournament. The tournament is held in the Boundary Bay beer garden and starts at 10am. We’ll start the morning off with mimosas and have the bar and BBQ open by the afternoon. Early registration is strongly encouraged and spectators are welcome. You can register online or right here at Boundary Bay over a pint! Forms can be picked up and dropped off at the bar. We also have a downlodable form you can print and bring in. Early registration $25 adults, $20 for seniors & students [Day of is $30] Everyone is welcome and encouraged to attend, though some knowledge of the game helps. Start practicing! 9/16 Boundary’s 19th Anniversary! We’re legal…in Canada! In celebration of our 19th Birthday, we’ll be releasing Batch 5,000 Imperial Porter. Swing by and try this heavy weight of a brew. If you like our Oatmeal Stout, you’re gonna love this. We recommend pairing it with dessert! 9/17 Finish Festival with Olli Hirvonen Olli Hirvonen will be performing with his trio, Red Reiter, on Wednesday, September 17th at 7pm. The Finlandia Foundation presents a night of beautiful Finish guitar music paired with a delicious Finish menu. $15 cover, all ages welcome. Have fun, be safe and designate a driver. Cheers, we can’t wait to celebrate with you!